Implementing crowdsourcing as the chief means of gathering information has had success from Wikipedia and the Oxford English Dictionary to Planters Peanuts. In fact, I would be so bold as to put Vita Brevis on this list – as comments from our readers have led to many breakthroughs in our bloggers’ brick walls. Jennifer Lyons suggested that I contact the New York Athletic Club for information about the Pastime Athletic Club, which was active from 1880 until the period of the First World War. KT found references to John J. McDermott dying before 1927 and Noel Ray later found references that pinned the death date to before 1909. John E. MacDermid also commented that his grandfather was John J. McDermott from Cape Breton, Nova Scotia. He was born in April 1868, and left Cape Breton at 1895 to work in South Africa. He was positive his grandfather was the winner of both the first New York and the first Boston Marathon. Paul Baltutis (who played a pivotal role in this research) put me in touch with Roberta Schulmeister, who had an heirloom belonging to John J. McDermott that was presented for his first place finish in a “marathon” race put on by the Knickerbocker Athletic Club dated 19 September 1896. As recent as last week, Noel Roy concluded, using newspapers and facial recognition, that Dr. MacDermid’s grandfather was not the same person as the John McDermott who won the first Boston Marathon. Using the hard work of Vita Brevis readers, I did not give up my research on the descendants of John J. McDermott. In fact, I dove in to each comment – beginning with Roberta Schulmeister’s ancestry, since she had concrete proof of a connection to John J. Maybe her ancestry held the key?! John J. McDermott … was presented [a prize] for his first place finish in a “marathon” race put on by the Knickerbocker Athletic Club dated 19 September 1896. Through information from Roberta I was able to determine that John J. McDermott was the son of James McDermott and Elizabeth Grady (Roberta’s great-great-grandparents). His birth record shows that he was born Johnny McDermott in Manhattan on 16 October 1874. Unfortunately, the trail went cold there: I could find no evidence of his death in New York City or New York State. Nor could I find his marriage (if he was even married). Julia McDermott married John Fitzpatrick in New York City in 1901. She had a son, Francis Fitzpatrick, who was born in New York City in 1902, but he died young. She also died young in 1905. She and her son were buried in Calvary Cemetery in New York City. John J. McDermott is not buried with his sister and nephew. James Edward McDermott was born in New York City on 13 October 1876; he married and moved to Buffalo, New York where he worked as a lithographer (!!). He died in Tonawandas, New York in October 1938. His obituary in Tonawandas does not mention his brother, John. Additionally, the baptismal records of the St. Francis Church in Tonawanda do not include any of James’s children (in the hopes that his brother, John was listed as a godparent). John J. McDermott is also not buried (as far as we can tell – more should be done to confirm) with his brother James in Mount Olivet Cemetery. Therefore, because crowdsourcing has worked so well in the past, I am extending my plea to help locate the final resting place of John J. McDermott, the first winner of the Boston Marathon. Maybe we can have this solved by the running of the New York City Marathon (another race associated with John J.) in November 2017? Who’s gonna solve it? A news item from The Brooklyn Daily Eagle 28 May 1909, refers to a planned professional Marathon race, saying that J J McDermott Jr, who won the first Marathon race ever run in America, has declared himself a professional and has entered the race. This seems to contradict the Star Gazette news item from 4 Jun 1906, which said that “Of the prominent runners who have competed in Marathon races, but one winner has died since the first BAA race in 1897. He was John J McDermott who won that year.” It says he died a few years later of consumption. This was a story about attempts to ban the races because of the extreme “brutal” training required. 3. The Boston Herald, on April 17, 1927, states that he “died several years ago of lung trouble. He had tuberculosis, however, when he won the race” [in 1897]. All of these tell a consistent, if disjointed story. We can now narrow down the time of his passing to the period 1898-1906, with the beginning and end years unlikely. It was common at the time to warehouse tuberculosis patients in remote sanataria, to be buried onsite to prevent contagion. This may explain the absence of a death record of any kind. As for the Brooklyn Eagle article, we know there was another John J McDermott who ran in the 1908 Yonkers and 1909 Boston marathons; he did not finish with the leaders in either event. It is likely that if he had turned professional, he might have represented himself as THE John J McDermott in order to increase his market value. One nit to pick: the New York City Marathon has no association with McDermott. The New York race he won in 1896 began in Stamford Connecticut and ran down the coast to the Bronx. It had no connection to the existing NYC Marathon, even historically. Noel, yes! Thank you for pointing out that error. I should have said that the marathon finished in New York City, not that the race was known as the NYC Marathon. You are also correct in that these two races are not affiliated in any way. – Date of Race: 19 September 1896. Therefore, given the heirloom is in Roberta’s possession, and that she has McDermott’s on her family tree, I am very confident that the parent information for John J. McDermott, winner of the first Boston Marathon, is accurate. Well summarized. I think this nails it. So he may have traveled west to be “cured,” and died across the country somewhere. The documentary gets into the details of where a lot of these people migrated. It’s been a while since I watched it, but I seem to recall L.A. was one of those places. This is awesome information! I’ve been combing through newspapers and I have not seen either one of these. It is the Boston Sunday Globe’s article on April 11, 1909 that also mentions John’s passing (a little more than a month before the May 28th article above). Amazing. The 1906 article is great because it gives us a smaller window for the possible death date. Thank you! I beg to differ with Noel Roy about the facial recognition between my grandfather and the winner of the first Boston Marathon. I think there is a lot of similarity! I measured the faces of the Marathon winner and grandpa’s from the family picture, both pictures are very close to the same size, and the results were the same, or very close for all of them! The head measurements were malar width, 1.3 mm, top of head to bottom of chin, 2.2 mm/. 2.3mm, nose, 0.6 mm brow to tip, eyes, 0.6 mm intra pupillary distance. Shoulders, 3.7 mm wide, top of head to waist 6.2 mm, bottom of chin to waist 3.8 mm, width of waist 2.6 mm, 2.9 mm. Grandpa was tall, probably 6′ 2″, and the winner was listed as 5′ 6″, but if both measured the same from top of the head to the waist, they must be the same height! The weight was listed as 124 lb but grandpa obviously had to weigh more than that! I believe he weighed @ 174lb. A 50 lb error in reading a balance scale is easy to make and with only 15 participants probably the same person weighed them all before and after the race. Grandpa left Cape Breton in 1892 for New York, and on to South Africa. I believe he was involved in Jameson’s Raid, Dec 22, 1895 to Jan 6, 1896, and was expelled because of it. This could place him back in New York in time to run the First NY Marathon, but not long enough to have a wife and children there! I will try to send pictures so you can measure and make up your own mind about them. I have pictures on Face Book under my Boularderie Family from earlier in 2016, including a picture we think is grandpa in a military uniform. You say if both measured the same from head to waist, they must be the same height. Not true! My father and our next door neighbor looked to be the same height while seated, but my father was a good 7″ taller when standing. 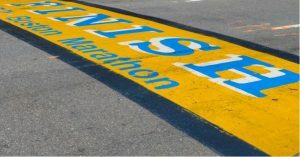 Linda, that is an interesting article because it says the race will take place on Labor Day in Boston (by the B.A.A.) and it will be a distance of 25 miles. The first race in Boston was April 19, 1897…….. Regardless, I don’t know if he was in the military – but of course it was possible! I’ve had a quick scan of the Boston papers on the day after Labor Day 1897. There are brief reports about a Centennial Grove event that included athletic events, but no mention of a marathon race. It’s possible the race got cancelled. I should also mention that I created an entry on Find A Grave for a possible John Mcdermott- but I’ve been able to eliminate him as our guy, because he is listed with other parents. Maybe this will lead somewhere? Good luck!! This is great Lindsay – I’ll try to look into it! Is there a cause of death listed for Elizabeth? Both she and two of her three children died young. And according to a newspaper report, John died of an inherited Pulmonary disease. Noel, the death index doesn’t show cause of death for Elizabeth- I’d have to order the FHL film or cert from NYC. However, Julia (John’s sister) did die of TB. In some articles, it says John had TB when he won that race. I have a real hard time believing that. Tuberculosis can be asymptomatic until it has become quite advanced. In fact, for a long time it was thought to be an inherited affliction, because it ran in families so much. This is now ascribed to family members living in close quarters and infecting one another during a fairly lengthy asymptomatic phase — although there can also be a genetic predisposition to the disease which can be inherited. It is an interesting question whether John suffered from TB, or some inherited pulmonary disease that perhaps was misdiagnosed as TB, or both. I planned on ordering Elizabeth’s death certificate. Hopefully over the next week. Also I know there is one article that said he died of consumption – which was another term for TB.